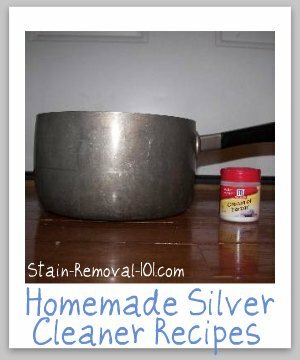 Here's a homemade silver cleaner recipe to clean the tarnish off your silver for less using natural ingredients and science. Just dip your silver in and see it shine. Silver tarnish is made of silver sulfide. 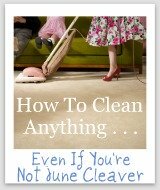 Cleaning silver with baking soda is one natural way to clean your silver. 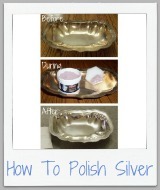 Of course, using baking soda as a silver cleaner works best if your silver just needs a touch up. However, if your silver is really tarnished there is another way to clean it, making your own homemade magnet, which is explained below. Don't worry, it is not as complicated as it sounds! 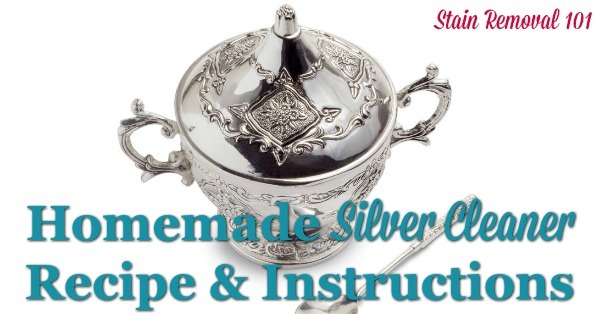 This recipe is best for ornate patterns on your silver that it would be difficult to hand polish. Hint: If you don't own an aluminum pot you can instead use a different type of larger pot, and place aluminum foil at the bottom of it. Heat water in an aluminum pan, and dissolve cream of tartar in the water. Hint: Did you know there are lots of ways to use cream of tartar around your home, in cleaning and stain removal? You can read this article about cream of tartar uses here. Add 2 tablespoons of cream of tartar for each quart of water used. Once the water is hot dip the tarnished silver into the aluminum pan, making sure the silver item touches the aluminum. When the tarnished silver touches the aluminum a neat scientific thing happens -- it creates a simple battery. This scientific phenomenom removes the silver tarnish from the silver item you want cleaned. 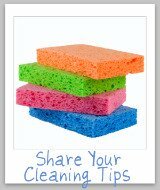 Do You Have A Silver Cleaner Recipe To Share? 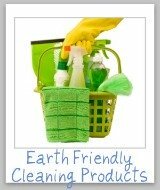 People come up with all kinds of homemade recipes and home remedies for cleaning things, and silver is no exception. 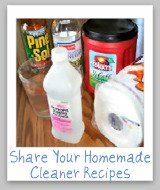 You can share your silver cleaner homemade recipes here, so we can all learn some additional methods for making our own silver cleaner.